Project archivist Anne Kofmehl is cataloging the Edward Ruscha papers and art collection, which the Ransom Center acquired in 2013 and which opens January 20. Kofmehl writes about an interesting photograph she came across while organizing the collection. Edward Ruscha (pronounced Rew-Shay) is an artist of many talents. Throughout his long career, spanning five decades, he has worn a variety of hats: painter, printmaker, and bookmaker, to name a few. He has worked with materials ranging from the traditional (acrylics and graphite) to the unusual (gunpowder and spinach), but perhaps none is more unusual than the decomposed granite used to make Rocky II, a large rock Ruscha fabricated and placed somewhere in the Mojave Desert in the late 1970s, around the same time the famous film starring Sylvester Stallone was released. In general, very little is known about this work, including its current whereabouts. Ed Ruscha, [Rocky I], Polaroid print, 3¼ x 4¼ inches. © Ed Ruscha. While processing Ruscha’s collection I came across a small Polaroid photograph, tucked away in a folder of miscellaneous projects, which documents an early stage in the production of the work. In a handwritten inscription on the back of the photograph, Ruscha referred to this early stage as Rocky I. In the course of my work, I hadn’t come across any mention of Rocky II, so I turned to Google for answers. It turns out that I was not alone in my search for more information about Ruscha’s obscure artwork. The French filmmaker Pierre Bismuth, who co-wrote the 2004 film Eternal Sunshine of a Spotless Mind, has made a documentary film, Where is Rocky II?, about his quest to find the rock. The film is completed but has not yet been released. Bismuth first learned about the rock from a 1980 BBC documentary he saw in 2006. 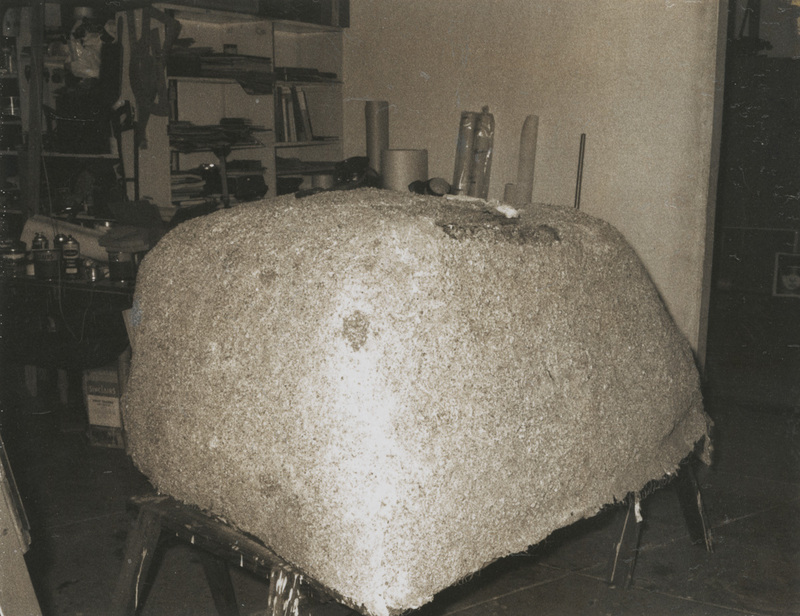 Since then, he’s been on the hunt to find the rock and learn more about why Ruscha put it there in the first place. A scene from the film’s trailer shows Bismuth posing as a journalist in 2009 at the opening of a major survey of Ruscha’s paintings at Hayward Gallery in London and asking the artist about the rock. Ruscha, who appears amused by the query, doesn’t offer many clues, though he does confirm that the rock is in the Mojave. This and other elements of Bismuth’s search form the basis of the documentary. 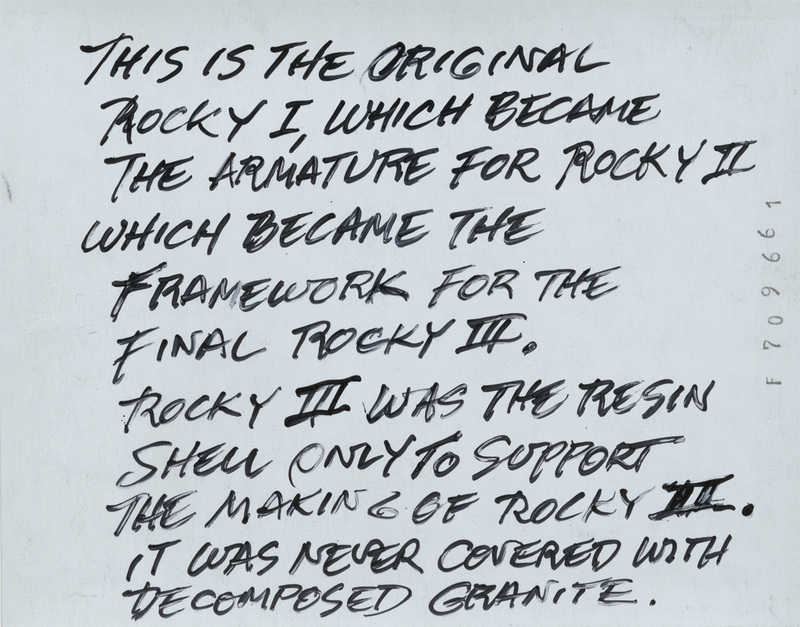 Paul Ruscha’s (Ed’s brother) handwritten notes on the backside of [Rocky I], Polaroid print, 3¼ x 4¼ inches. © Ed Ruscha. Whether or not the photograph will play any part in solving this puzzle remains to be seen, but it is nice to know that here at the Ransom Center we have a piece of the mystery to share. This photograph is just one of many treasures to be found in the Edward Ruscha papers and art collection. The collection will be made available in the Ransom Center’s reading and viewing room to students, researchers, and the public beginning January 20. Ed Ruscha will be in Austin on January 20 at 6 p.m. for a conversation held at the Blanton Museum. View event details at http://www.hrc.utexas.edu/events/. Filed Under: Art, Cataloging Tagged With: Cataloging, Ed Ruscha, Mojave Desert, Pierre Bismuth, Rocky I, Rocky II, Where is Rocky II?